This October set record rainfall for Truckee-Lake Tahoe today. Needless to say, The Truckee River is flowing pretty good for late fall. For more images click here. Give me a follow on Instagram if you can. In fact as I write this, the river is having a big push. Over 1000 cfs here in the Hirsh, it was 400 this morning. Looks like up by Squaw and Alpine they got loads of rain, and the creeks up there are pumping into the river. The river came up overnight on Friday came down and is up again. It should level out by mid-week. The fishing is fantastic right now. If you like to streamer fish, it’s kinda game on. I really haven’t busted out the nymph rigs too much this week. Its fun when the meat out fishes the bead heads. Off color water means fish get off their game and can be fooled easy. 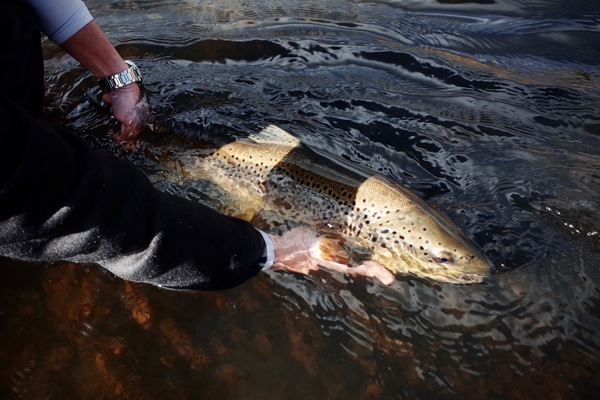 Brown trout get very aggressive in the fall. Kinda the time right now for a big brown trout. Like I said in the last report we really haven’t had any good fall fishing in the last few years. 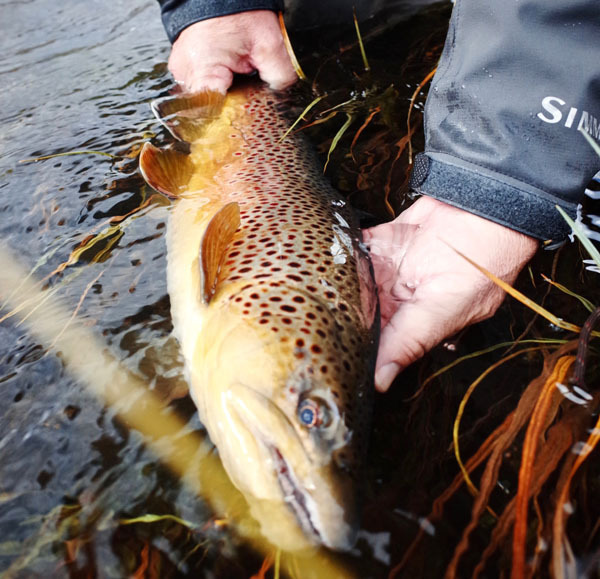 This year is like past years when we’ve had water in the river, good fish’n, some of the best in the West in my opinion. The Little Truckee River is up a bit, 37 cfs. That’s more normal fall flows for out there. Can be some good dry fly fishing in the fall on the LT. Still have one slot left for the switch rod clinics at Pyramid Lake.